Are you prepared to care for your aging patients? 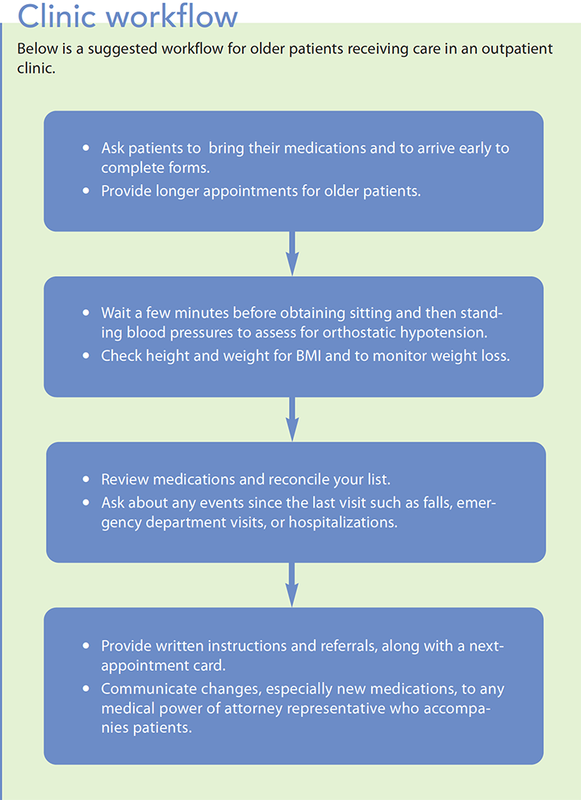 Specific needs of older patients can affect the clinic schedule. Preparing your clinic to care for older patients and accommodate their needs can improve clinic flow. Adult outpatient clinics are serving many patients over 65 who require more time and visit providers’ offices more frequently than younger patients. (See Aging by the numbers.) If you’re practicing as a staff nurse or clinic manager in an adult primary care clinic, you’ve probably noticed the impact that even one older patient can have on the clinic schedule. Perhaps it takes more time to bring these patients to the exam room or the appointments go over the average time. You’re not alone. Older patients bring certain challenges to outpatient clinics because they have more chronic illnesses, use more medicines, experience more hospital stays, and use emergency departments more than younger patients. 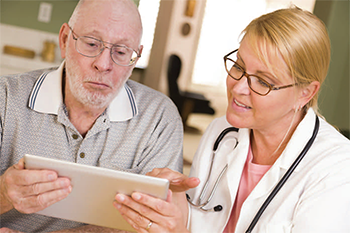 This article addresses barriers to caring for older patients— time management, workload, inadequate educational preparation, and age bias—and suggests simple approaches and geriatric-specific tools that can help you meet this population’s needs. Clinic staff may perceive older, slower, more complicated patients as a “problem,” especially if most of their patients are younger with fewer health issues. Challenges related to providing care to older patients include time, communication, and transitions. Older patients may require more time because of complicated and specialized needs; they may arrive late because of dependence on other drivers; and they may move slowly as a result of gait issues, walkers, or wheelchairs. Hearing and vision loss and cognitive changes may slow down check-in and medication reviews. And with each transition and facility discharge, medication lists change, which can worsen poly pharm acy and make medication reconciliation challenging. This population also adds to the clinic workload because of home health and durable medical equipment documentation, discharge follow- up, and the acquisition of medical records. Additional demands include completing advance directives, facility admissions, and family leave documents. One caution: Don’t stereotype older patients. Although many require more services and time, you’ll sometimes be surprised by the 90- year-old who lives alone, takes few medications, and still drives. Geriatric education in nursing and medical schools lags behind the aging population. Though the number of seniors is increasing, fewer health – care professionals are prepared for these patients. With less knowledge about aging, ageism and bias may lead to decreased patience and incorrect assumptions by staff and pro – viders, resulting in inadequate care, including over- or under-treatment. Lack of sufficient focus on geriatric education also means that there aren’t enough specially educated geri atricians and adult/geriatric nurse practitioners to manage the 65-andolder population. Those who do receive specialized education often work at geriatric clinics associated with universities. These clinics offer longer appointments, a team approach to care, and comprehensive assessments, but they aren’t available in all areas. This means that providers in primary care clinics need to take steps to prepare for caring for the growing number of older patients in their communities. Although your primary care clinic won’t be a geriatric center, you and your colleagues can make adaptations to better treat older patients. complete a literature search to support your evidence-based quality-improvement efforts. As a team, you can evaluate if current schedule, documents, and office procedures need any adaptation for older patients. For example, allowing 60 minutes for new patients and 30 minutes for established geriatric patients will provide more time to evaluate and manage chronic illnesses and function. 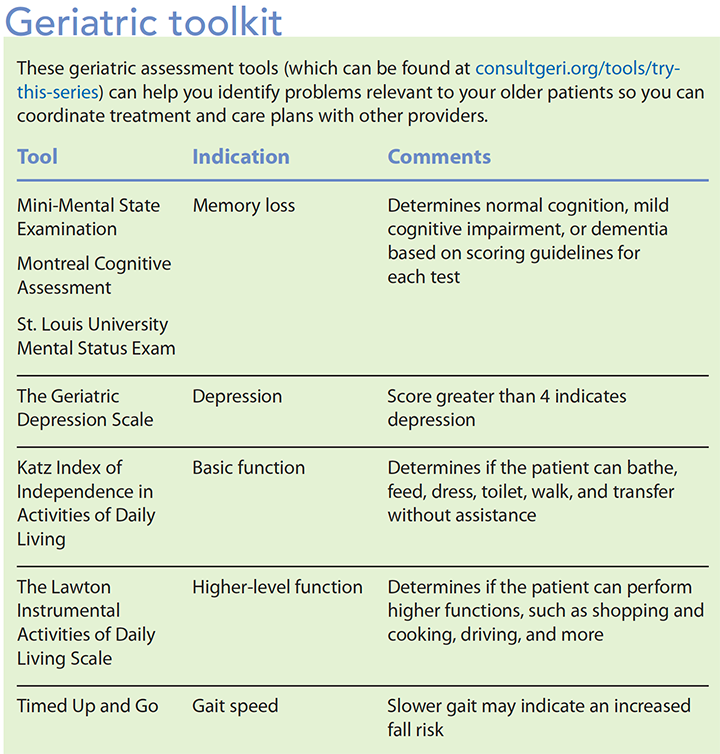 After geriatric assessment tools are chosen for the clinic, create a toolkit for each exam room to facilitate evaluations. Store assessment tools within reach in labeled hanging file folders. The staff can become familiar with many of the assessment tools at the ConsultGeri Try This: Series (consultgeri.org/tools/try-this-series), which has videos and instructions for each tool. To save time, staff can complete some tools before the provider sees a patient. Be sure to also arrange for staff education related to older patients’ needs. Ask patients to arrive early to accommodate for slower gait and slower completion of documents, such as new or established patient packets, and any assessment tools. Adapt when sensory loss is present. Make eye contact while speaking with patients who are hard of hearing and read lips. Provide patients with large-type documents to complete and read. Be sure you and other providers review the completed geriatric assessments for changes in status and the reconciled medication list for duplications and polypharmacy. If needed, complete additional assessments from the toolkit. Assessments may need to be completed over multiple appointments, depending on time constraints. Even after making your clinic more geriatric responsive, you’ll have patients whose medical conditions demand more than a primary care clinic can provide. If possible, identify a geriatric specialty clinic in your area for referrals. Simple changes to clinic flow and adaptations for older patients’ sensory and physical needs can make your clinic more sensitive to patients who are over 65 years old. These changes require a team approach. Adding specialized geriatric evaluation tools focusing on function and chronic disease along with longer appointment times will allow your clinic to provide more comprehensive care for this growing population. Your patients and their families will notice your efforts. Maureen Stabile Beck is a gerontological nurse practitioner at the McGovern Medical School The University of Texas Health Science Center at Houston. Welsh TJ, Gordon AL, Gladman JR. Comprehensive geriatric assessment—A guide for the non–specialist. Int J Clin Pract. 2014;68(3):290-3.